This evening, shortly before posting a new promo video for the G Watch, LG also announced three new tablets to its G Pad line – the G Pad 7.0, 8.0, and 10.1. All three tablets will be officially unveiled May13-16 at MedPI 2014, a European tech show. These new tablets are joining the G Pad 8.3 to provide new options for tablets users who want choices in size. No specs have been given, but all include LG’s proprietary UX with features like QPair and Knock Code. As you can imagine, the 7.0 is a 7-inch tablet that is made for one-handed use. The 8.0 is a mid-sized tablet with an “immersive multimedia experience.” The 10.1 is the big dog, a tablet that provides “endless hours of entertainment and fun.” And that is all we know. 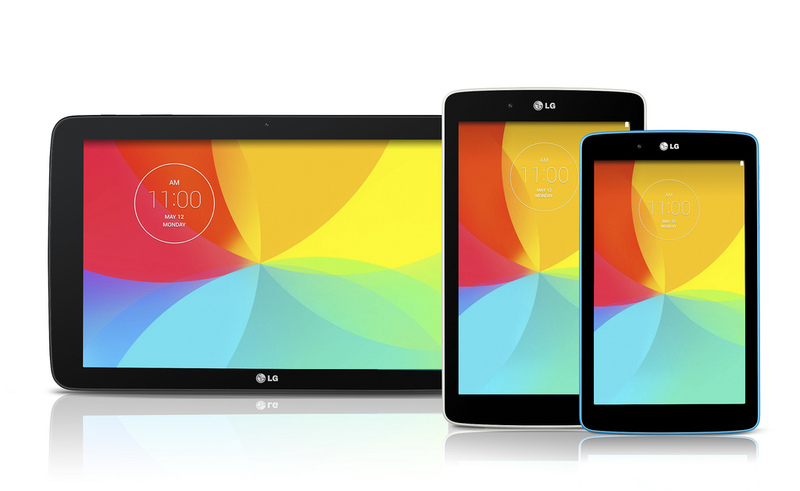 SEOUL, May 12, 2014 — LGElectronics (LG) is adding three new tablets to its G Pad series to offer more options for tablet users. The new G Pad devices — G Pad 7.0, G Pad 8.0 and G Pad 10.1 — will be unveiled at the MedPI 2014, one of the biggest IT/Tech trade show in Europe, taking place in Monaco from May 13-16. LG’s extended tablet portfolio, which also includes the well-received G Pad 8.3, will significantly expand LG’s footprint in the tablet market. The latest G Pad tablets will also include LG’s proprietary UX features such as QPair 2.0 and Knock CodeTM. With an updated version of QPair, which was first introduced on G Pad 8.3, users can effortlessly connect to their Android-powered smartphones via Bluetooth to receive notifications of calls and messages and now be able to respond directly from the G Pad. What’s more, Knock Code™ enables users to power on and unlock their LG smartphones in one easy step by entering a personalized “knock” pattern on the smartphone’s display. Knock Code™ offers convenience and greater security as the knock pattern can be entered anywhere on the screen in any size — with the display on or off — using a personalized sequence of two to eight taps for more than 80,000 possible combinations.